A professor who helped put the University of Oregon on the world’s musical map will have his legacy live on thanks to a former student’s $1 million gift establishing a faculty chair in his name. The Edmund A. Cykler Chair in Music will receive an additional $1 million in matching funds from the Presidential Fund for Excellence, created last year by UO president Michael Schill with a $50 million gift from an anonymous donor. “I wanted to honor him for what he’s done at the University of Oregon and what he’s done for me personally,” said UO Foundation trustee Timothy Foo, who made the gift. Foo studied music education with Cykler at a year-long, UO-sponsored program in Germany back in 1966. After his year abroad, Foo went on to attend classes on the main UO campus, where he earned both master’s and doctoral degrees in music education, with Cykler serving on his dissertation committee. Foo served on the music faculty at Drake University for a number of years before moving into his family’s investment business. Cykler was described as a “tireless builder of bridges from Eugene to the world” in an award citation he received from the Eugene Arts Foundation in 1985. He established the UO Chamber Music Series, which has been attracting internationally acclaimed artists to Eugene since 1967 and recently celebrated its 50th anniversary under the ChamberMusic@Beall banner. Cykler also helped organize the International Society for Music Education in 1955 and was made a life member for his contributions in 1975. 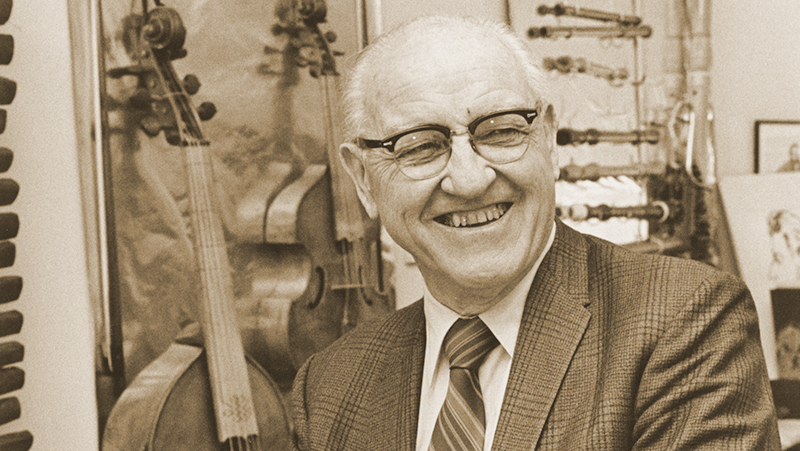 He served as director of the UO Symphony from 1947-55 and associate dean at the School of Music from 1969-72. And he was a trailblazer in fostering important connections with the European musical community. Former professor Royce Saltzman said he was following in Cykler’s footsteps when he took a student group to Germany in 1968 — a trip that led to the creation of the UO’s Grammy-winning Oregon Bach Festival. In an intriguing footnote, Cykler also was a descendent of a group of popular yodelers from the 1800s known as the Rainer Family, who Cykler described as The Beatles of their day. Their main claim to fame was taking the Christmas carol “Silent Night” from obscurity in a remote German town in the Black Forest, where it had been written by a local priest and his organist, and turning it into a worldwide hit that has been translated into more than 60 languages. Cykler’s daughter, Carol Haviland, said her father, who passed away in 1988 at age 84, “would have been very, very pleased” by the establishment of a faculty chair in his name, even though he had been modest about his achievements. The Edmund A. Cykler Chair will become the third endowed chair at the School of Music and Dance, along with the Philip H. Knight Chair and Robert M. Trotter Chair of Music Studies, named after a former dean and Cykler contemporary.